Growing in Character and Academics. GCA support the importance of decoding in teaching children to read. However, at this stage, beside building up the good habit of reading, understanding the message, thinking critically about the content, using imagination, and making connections is at the heart of what it means to be a reader. 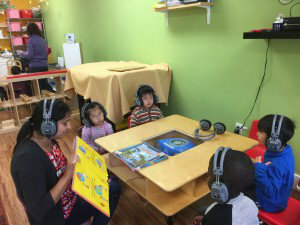 Listening Centre is a place where your children would hear models of fluent reading. They would benefit listening to an accurate reading of the text set at an appropriate pace with plenty of expression. GCA provide the exposure to models of fluent reading that would have a positive impact on children’s oral reading fluency. We also support you reading to your child at home. The bonding between you and your child during the reading time will last forever in her/his heart. In October we will be distributing our reading log for you to fill. By the end of semester, we have an award ceremony where we will be doing things such as giving medals to your child, etc. We hope you would utilize this reading log and fill it together with your child.